Nigel Westbrook (Melbourne) Reinterpreting the Mamboury Survey of the Upper Great Palace. Kerim Altug (Istanbul Municipality) Recent Discoveries on the Great Palace: the Late Antique Water Supply. Javier Arce* (Lille) The Palace of Galerius Caesar: doubts and contradictions. Maria Duggan (Newcastle) Changing understandings of Tintagel: royal power in an Atlantic context. Rhea Brettell (Bradford) Organic residues from mortuary contexts (Britain). Literacy is a central aspect of society from antiquity to the present day, but there is often a disconnect between the study of written texts and the attention paid to the materiality of their production and consumption. This workshop aims to address the particular qualities of the materiality of writing in the pre-modern period, an era in which the technologies of writing by hand were paramount. Scholars researching material aspects of writing exist within diverse disciplines (Archaeology, Art-history, Calligraphy, Classics, English, History, Papyrology and Palaeography). Methods and approaches are diverse, ranging from studies of writing form and style, to technologies of writing and the wider social context of literacy and cultural transmission. Within individual disciplines, there are established traditions of scholarship that tend to constrain how the material is approached, and there is little cross-fertilization between scholars working either in different periods, or from different disciplinary perspectives. The workshop brings together scholars and experts across a wide range of periods and disciplines to foster new perspectives and to explore future directions that encourage interdisciplinary collaboration. This will include a consideration of writing as a material practice, the subsequent treatment and curation of writing documents, and the relationship between writing equipment and written documents. We will provide a fresh exploration of writing practices from Antiquity to the Early Modern period and consider the interplay between practices of literacy and diverse aspects of social and cultural identities and experience. A practical calligraphy session and a trip to Canterbury Cathedral Archive are included in order to foster an awareness of the material processes and equipment of writing, enabling scholars to gain new perspectives on the historical material culture that they study. A discounted rate of £20 for the 2-day workshop is available to Roman Society members. ENVIRONMENT AND SOCIETY IN THE FIRST MILLENNIUM A.D.
13:15-13:45 M. Morellon, G. Sinopoli* et al. and a major environmental catastrophe? Places are limited. To register for the conference write to M.Mulryan@kent.ac.uk before 5th October. Registration opens at 9:15. The conference begins at 9:30. Cost (to be paid in advance): 12GBP for students and OAPs; 25GBP for others. The time is ripe to place environmental issues at the heart of debates about Late Antiquity. Recently, a paper on the climate change during the age of Justinian, published in Nature, received coverage in all major American and European newspapers. This article is not an isolated case, yet mainstream late antique scholarship has not so far absorbed this work. This conference will be a decisive step in making the late antique community aware of a whole range of environmental phenomena that affected Mediterranean and northern European societies at the end of Antiquity and the Early Middle Ages. We will adopt a Mediterranean-wide approach and look at the period of Late Antiquity from a broader chronological perspective, that of the 1st millennium A.D. This time frame is critical to interpreting climate and vegetation data, which are most meaningful in a long-term context. The conference itself has two aims. Firstly, it will present the rich pollen and scientific data available for the study of the first millennium AD in different regions. 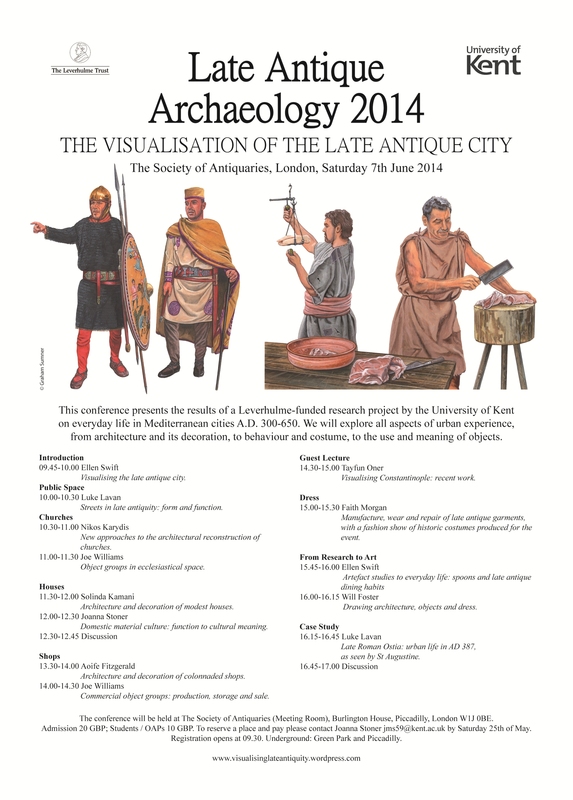 Secondly, it will develop and reinforce the environmental perspective on Late Antiquity. The focus on the whole Mediterranean (with its hinterland in Northern Europe) will correct a bias towards the East seen in recent studies on the environmental history of Late Antiquity. The conference will interest not only scholars of the 4th to 7th c., but also early medievalists and students of earlier Graeco-Roman Antiquity. Generously supported by Princeton Institute for International and Regional Studies, John Beale & Brill Academic Publishers . I am pleased to announce the opening of the following website, on the visual reconstruction of late antiquity. This is a research project of the University of Kent, supported by the Leverhulme Trust, undertaken by 2 academics, 5 doctoral students and 2 artists. Our gallery is now live, with a suite of images reconstructing the visit of Augustine to Ostia in A.D. 387 as described in Confessions book IX. It will be updated with scenes of everyday life over the next six months.